The fight against mosquito-borne diseases has gained another child-friendly weapon, in the form of a fun game that conveys important lessons to children about prevention. The game, Humans vs Mosquitoes, teaches children to be vigilant and constantly on the lookout for mosquitoes, which transmit potentially deadly diseases such as malaria and dengue. Humans vs. Mosquitoes was developed towards the end of 2011 by a team of staff and graduate students from New York-based Parsons The New School for Design, and Yale University respectively. It was initially planned as a dengue education platform but developers are adapting it for malaria as well. The game was intended primarily as a tool for the Red Cross Red Crescent to use to educate people, especially children, about the risk factors associated with malaria and dengue, and to know how to prevent being bitten. It uses easy-to-understand ways of getting across concepts such as climate change and disease transmission, and the importance of preventive action. Once children have absorbed the message, they can easily share it with their family and friends and spread the game in their own communities. Humans vs Mosquitoes was introduced to delegates at the COP17 climate change conference, held in Durban in December 2011. According to the developers, it was well received and people were eager to give it a try. “Those who have played it understood the purpose and how to play, and had fun in the process,” wrote co-developer, Lauren Graham, a Yale masters student on the university’s School of Forestry blog. The game involves two opposing teams of at least three – the humans and the mosquitoes. No expensive or complicated equipment is needed, but players may choose to play one of two versions – tabletop or outdoors – depending on the space available. The game is played in rounds, during which humans either have to eliminate mosquito eggs or avoid being bitten, while mosquitoes have to lay eggs, or bite a human. They indicate which action they decide to take with a certain hand signal. The eggs can be anything – little pebbles or beans, for instance – and the mosquitoes start off with a certain number of eggs which they must lay before play starts. The humans, meanwhile, have a certain amount of blood tokens which must be conserved. They lose one blood piece for each bite, and when all the blood is gone, the player is eliminated. Things get interesting with climate change cards, which introduce a twist into the game by presenting a climate change scenario that could influence the behaviour of the insects or make humans more susceptible. According to Graham, the developers are now teaching Kenyans to play the game, while looking at packaging the game for global distribution. 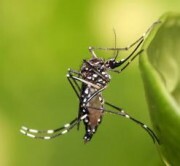 Dengue is spread by female mosquitoes of the Aedes genus, mainly A. aegypti, while malaria is spread by the female Anopheles mosquito, mainly A. gambiae in Africa. Malaria is caused by the Plasmodium microorganism, which is transmitted through an infected mosquito’s saliva when it bites its next victim. The disease is a result of infection by one of five Plasmodium species, of which P. falciparum is the deadliest. Far less commonly, malaria can be transmitted through infected blood or contaminated syringes. Dengue is caused by one of four viruses of the Flavivirus genus, and is also transmitted in the saliva of the tiny pest. This genus includes the viruses that cause yellow fever, West Nile fever, tick-borne encephalitis, and others. In some cases, dengue develops into the potentially fatal dengue haemorrhagic fever or dengue shock syndrome. Malaria affects red blood cells, while dengue affects white blood cells. Both can cause serious damage to vital organs such as the liver. The best way to prevent the spread of both diseases is to be aware of the conditions in which the mosquitoes thrive, and to eliminate them. This means keeping the house free of mosquitoes at night, emptying containers that may hold stagnant water, spraying insecticide inside, using bed nets – especially impregnated ones, using topical mosquito repellents, and wearing protective clothing such as long-sleeved tops. Vigilance is key to success. In both cases, there is no effective vaccine, although research is intensive and ongoing. Anti-malarial drugs are available to kill the parasite, if the mosquito manages to get past all the safety measures, but there is no specific treatment for dengue and patients receive supportive treatment for symptoms. World Health Organisation statistics reveal that half the world’s population lives in malaria risk areas, and that about 216-million people developed the disease in 2010. Of the ones who don’t survive, 89% of the deaths occur in Africa, and most of those are children under five years of age. Almost as many – over 2.5-billion people – are at risk of contracting dengue. It’s estimated that up to 100-million cases of dengue and as many as half a million cases of dengue haemorrhagic fever occur every year. Perhaps ‘Humans vs Mosquitos’ is the best form of prevention. Image 1: A Senegalese child with an impregnated mosquito net, one of millions which have been distributed in risk areas around the world. Image 2: (Red Cross Red Crescent) The Aedes mosquito can be recognised by the white spots on its thorax and legs. Image 3 (Wikipedia) COP17 delegates enjoy a rousing game of Humans vs Mosquitoes. Come on tech heads we need an online or better yet a smartphone version of this game, it’s looks pretty straight forward. Maybe everytime the game is played $0.01 can be donated to prevention of malaria ?